Organic growth drove revenue: Phase One of Hewlett-Packard (HP) build to suit (BTS), completed in October 2016, has started to contribute significantly to revenue. The completion of Phase Two on 23 June will be another trigger to revenue growth. Pre-emptive divestment of non-core asset: Divested 65 Tech Park Crescent (Light Industrial Building) on 20 July at its last valuation (as at end-March 2017) of S$17.6 million, which is 34% above the acquisition price in 2010. The Manager had anticipated efficiency loss if the property were to be converted to a multi-tenanted building when the existing master lease expires in November 2017. Divestment proceeds will be redeployed into the ongoing committed development projects. No interest rate exposure for FY18: 72.8% of total debt has been hedged for a weighted average tenor of 3.7 years. No hedges are expiring in FY18. 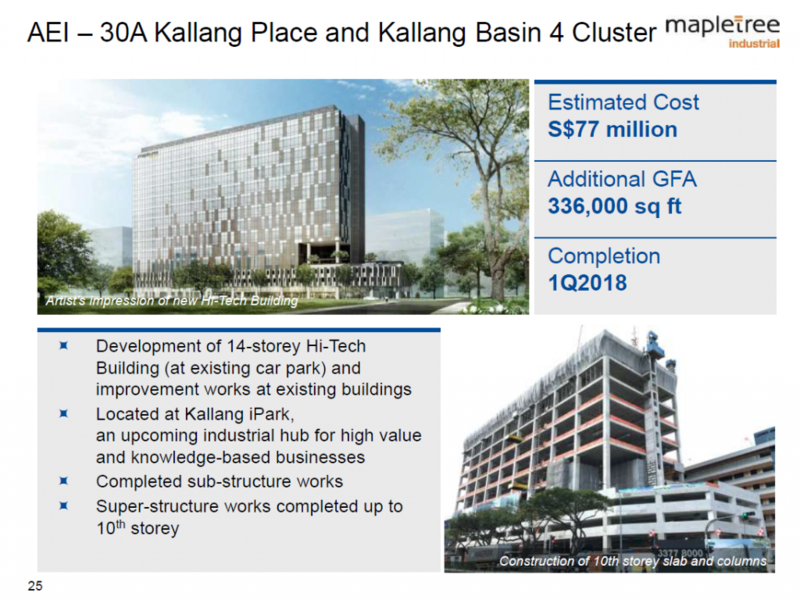 Marginally lower QoQ occupancy from 93.1% to 92.6%: Driven by lower occupancies at Flatted Factories (non-renewals by some tenants) and Hi-Tech Buildings (temporary effect following completion of Phase Two of the HP BTS which was unoccupied). Portfolio weighted average rental reversion of -2.0%: Driven by negative reversions at Hi-Tech Buildings (-7.7%), Business Park Buildings (-4.5%) and Stack-up/Ramp-up Buildings (-1.5%). The lower rent at Hi-Tech Buildings came mainly from tenant renewals at the Toa Payoh North 1 cluster. Meanwhile, lower rent at Business Park Buildings was from a larger tenant (Sony) renewing about 80,000 sq ft of space. The outlook remains stable. While sector-wide reversions remain weak, there is a tapering of supply of industrial space in 2018 and indications of an uptick in industrial activity. Mapletree Industrial Trust (MINT) has a pipeline of projects coming on stream (see overleaf). 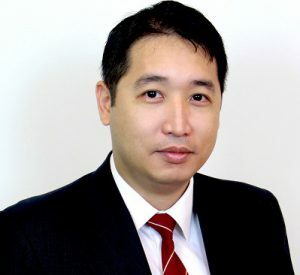 Management reiterated its desire to increase the REIT’s exposure to the data centre asset class. We raised our FY18e/FY19e DPU forecast by 2.1%/1.2% as we revisit our property expenses assumptions. We also increased our terminal growth assumption to 1.5% from 0.5% previously, on account of the visible pipeline of projects, but more importantly, at 29.8% gearing, MINT has >S$600 million of debt headroom available – potentially growing the portfolio by ~17%. Our target price represents an implied 1.41x FY18e P/NAV multiple, which compares against the FTSE REIT Index forward 12-months P/NAV multiple of 1.05x. The asset enhancement initiative (AEI) remains on track for completion in 1Q 2018. The super-structure has been completed up to the tenth storey. Pre-commitment level remains unchanged from the previous quarter – a child care centre taking up about 3% of the space. 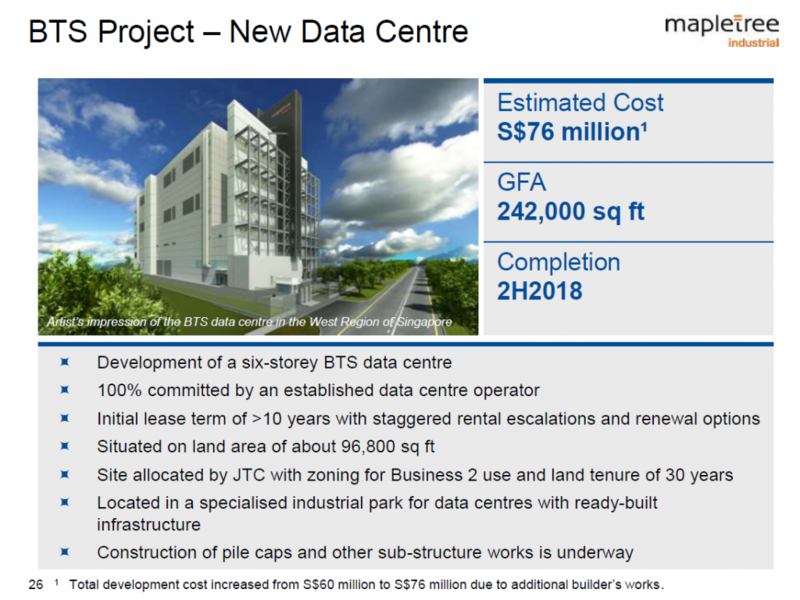 The key highlight was an increase in estimated cost to S$76 million from S$60 million previously. The increase in development cost is due to additional specifications by the user. There will be a corresponding improvement in rent as well. MINT is trading above the peer average P/NAV multiple and at a lower 12M-trailing yield than the peer average.